Though a northern state that can see harsh winters, Delaware is still home to many varieties of cold-blooded snake. Many are burrowers and are often hard to spot. Others live near the water and make a diet of amphibious creatures. Though two species are venomous, the majority of Delaware's snakes do not have a bite that is dangerous to humans, just to the prey they feed on. Delaware is home to two species of venomous snake: northern copperheads and timber rattlesnakes. As the name suggests, the northern copperhead has a copper-colored head. The rest of the body is covered with dark reddish-brown scales with lighter-brown crossbands. They typically grow to around 76 centimeters (30 inches). 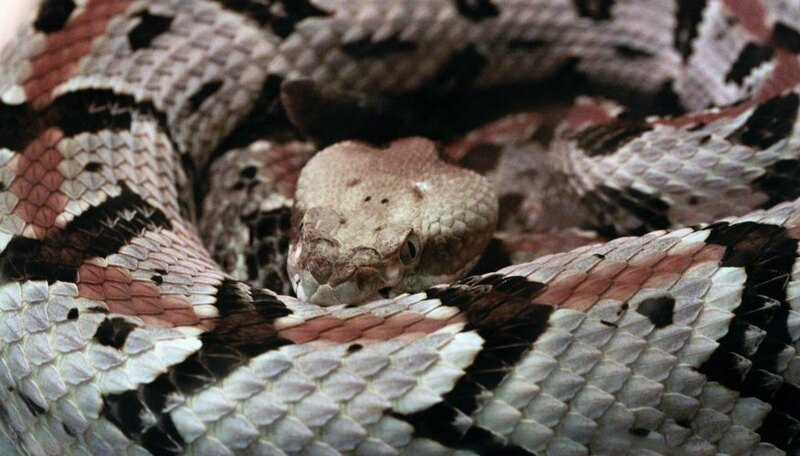 Timber rattlesnakes are larger predators, growing to upwards of 152 centimeters (60 inches). 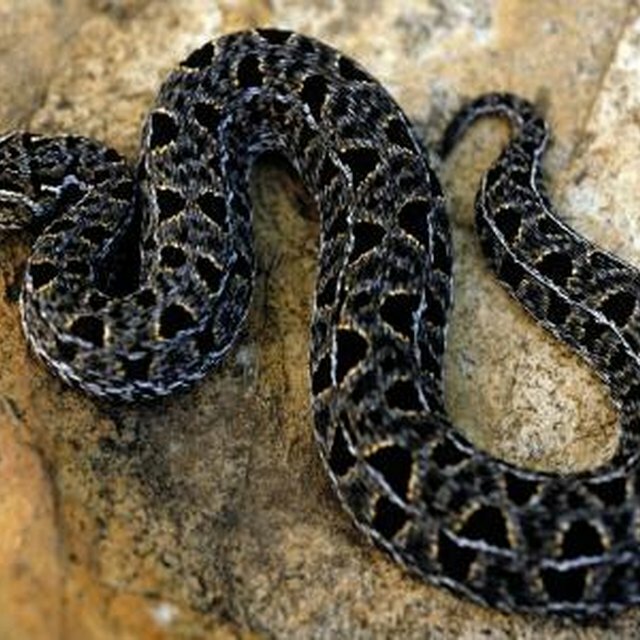 The rattlesnake is grey with black chevrons. They also have a distinctive stripe that runs the length of their back. The stripe can be a range of colors, from yellow to brown. Both snakes have a venomous bite, but with proper treatment, neither bite is usually fatal. Delaware also plays host to many large, nonvenomous snakes. Among them is the northern rough greensnake, which eats mostly insects and possesses a mouth that is a vivid shade of purple. The eastern hog-nosed snake is often found in sandy places, where it can use its shovel-shaped snout to dig up toads. Also found in Delaware is the northern scarletsnake, whose red, yellow and black coloring resembles the venomous coral snake. Other large snakes in Delaware include the northern black racer, milksnake, cornsnake, eastern kingsnake and eastern ratsnake. A handful of snakes under 61 centimeters (24 inches) can be found in Delaware. One of the strangest is the eastern wormsnake, whose plain brown top and pink scales even give it the appearance of a worm. Also in Delaware is the queen snake, which only feeds on crayfish and so is always found near water. Among the most common small snakes is the ring-necked snake, which is named for the orange or cream ring found around its neck. Additional small species include the northern red-bellied snake and the northern brownsnake. Some snakes are more fond of water than others. The northern watersnake is marked by dark-colored blotches and is often mistaken for the venomous cottonmouth. The red-bellied watersnake may have water in its name, but it is known to be more terrestrial than other similar species. Its diet is primarily fish and amphibians, though, so it's never far from a water source. The common ribbonsnake also eats primarily amphibians and has been known to avoid predators by quickly swimming away to safety. Three other snakes in Delaware are the Northern Pinesnake, the Eastern Smooth Earthsnake, and the Eastern Gartersnake. Michelle, Meg. "Types of Snakes in Delaware." Sciencing, https://sciencing.com/types-snakes-delaware-8514520.html. 13 March 2018.